Delta College Q­TV will premiere their new local documentary "Sailing into the Past - Travels Aboard El Galeón Andalucía and the Tall Ship Celebration," Thursday, March 9, 2017 at 8:00 pm. 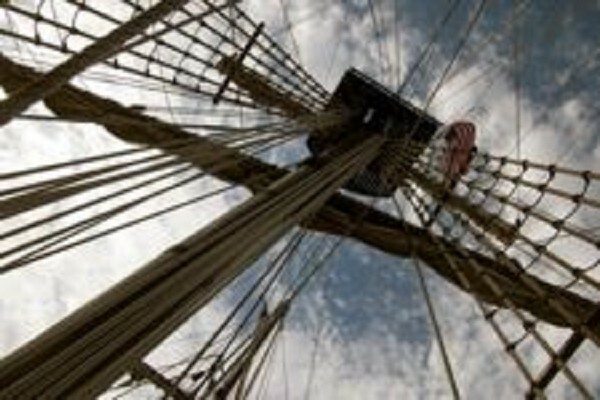 The documentary takes you aboard El Galeón Andalucía, the replica 16th-century Spanish galleon that took part in the Tall Ships Challenge tour of the Great Lakes during the summer (which included Bay City as one of the port city stops) on July 14­ 16, 2016. The 170 foot El Galeón Andalucía is the only Spanish Galleon style ship sailing the world today. Galleon­style ships were used to discover and then establish trade routes between Spain, America and the Philippines islands between the 16th and 18th centuries, and formed what was then called the "Fleet of the Indies". For three centuries, Spanish galleons crossed back and forth over the Atlantic Ocean, sailed around the Caribbean Sea and the American coasts, and also covered the Pacific route as well. Built by the Nao Victoria Foundation in 2009, El Galeón Andalucía came to the United States from Seville, Spain in 2013 to celebrate Florida' s 500th birthday and has been traveling around the country ever since.